A man who sexually assaulted a woman he met online has been jailed for five and a half years and ordered to stay off Tinder. Patrick Nevin, a 37-year-old software engineer from Dun Laoghaire, attacked the woman in his car after she agreed to go for coffee with him in 2014. Nevin was very active on Tinder during the summer of 2014. He told Gardaí he had a thousand matches and used it to hook up with women. On July 23rd 2014, he picked up a Brazilian student he met on the online dating app. She had agreed to go for coffee with him. He told her he’d take her to the best coffee shop in town but instead he drove her to a secluded part of UCD’s campus and forced himself on her. He was convicted of sexual assault a year ago and was jailed for five and a half years today. Judge Cormac Quinn described the woman he attacked as a “vulnerable young lady”. He said Nevin communicated with her through Tinder while knowing she was foreign with very little English and he said it was clear their contact through the app didn't give him consent for what was to follow. 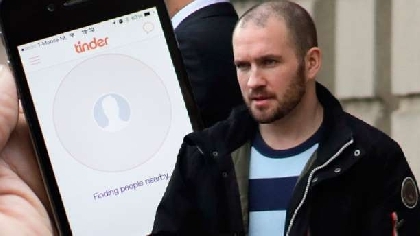 Nevin was also ordered to stay away from such apps for two years post release and will be sentenced next month for attacking two other women he met on Tinder.